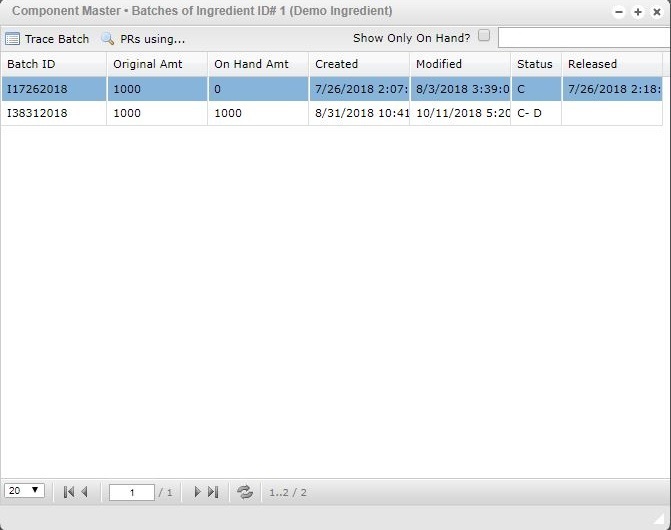 The Batches Of… window allows you to find batch information based on your chosen ingredient from the Component Master window. On this screen, you are able to sort batches by their ID, original amount, the amount on hand, creation date, modified date, current status or the release date if available. Each of these headings can be clicked to adjust the sorting option that meets your current needs. Once you select a requested batch record, you will have 2 options to choose from to continue, Trace Batch and PRs Using.. Each of these options will open a new window that provides more information about your selected batch. More information on these options and their functions can be found below. Trace Batch – The Trace Batch window provides a detailed look at product loss and gain from an individual batch ID. Furthermore, you have the ability to view the order sheet or production sheet at each step to determine how product may have been lost or added. PRs Using… – The PRs Using window allows you to view all production records that are associated with the chosen Batch ID. Once you choose the requested production record, you can click the View Production Record to open the production record in a new window and obtain more information.